The rest of the class works with this implementation, am I right in assuming that calling this function will move the motor 8 steps, and not one, or is there something I do not understand. There are many explanations on the web for this problem with full details . This dual coil 4 wire configuration uses bipolar current in 4 phases for 4 steps or 8 half steps or 16 quarter steps and more . 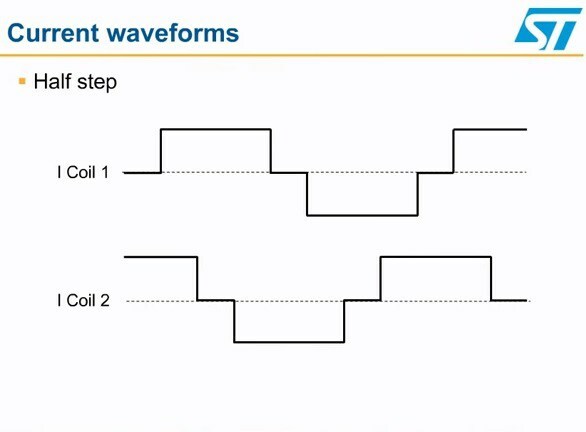 Speed and torque are tradeoffs for higher resolution with fractional current steps. Here you can convert the state changes in current to binary logic to mean bipolar current shown here with 8 half-steps that can repeat repeated for the number of rotor+stator poles per rev. x4. Full steps have the greatest torque. Not the answer you're looking for? Browse other questions tagged microcontroller stepper-motor or ask your own question. How do I choose an appropriately sized stepper motor? Stepper Motor Big Easy Driver Undervoltage?